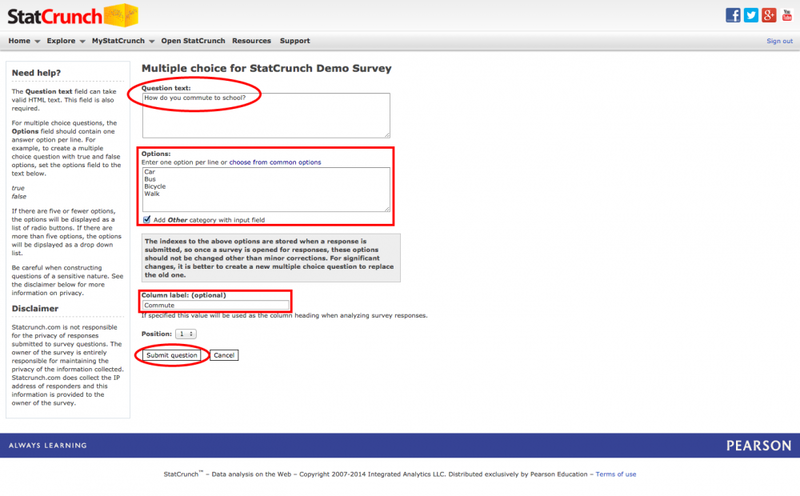 This tutorial covers the steps for creating a survey in StatCrunch. 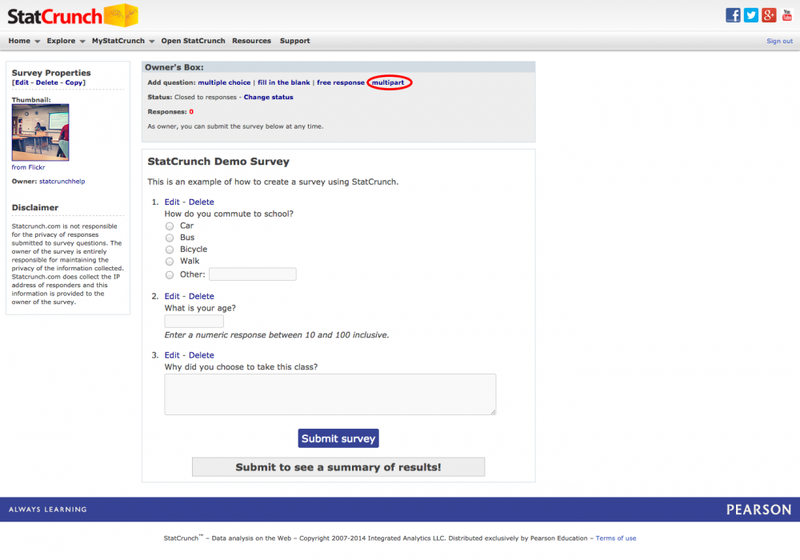 While a StatCrunch account is required to create a survey, a survey can be answered on any device with internet access with or without a StatCrunch subscription. 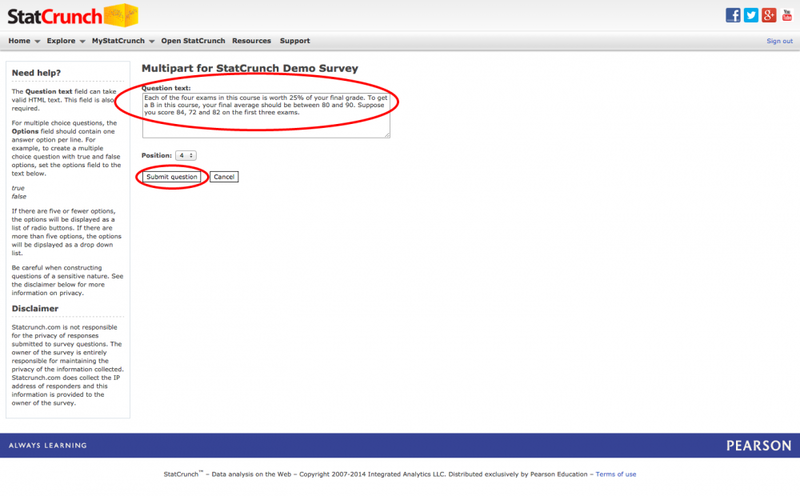 The survey results can be easily pulled into StatCrunch software to be analyzed. 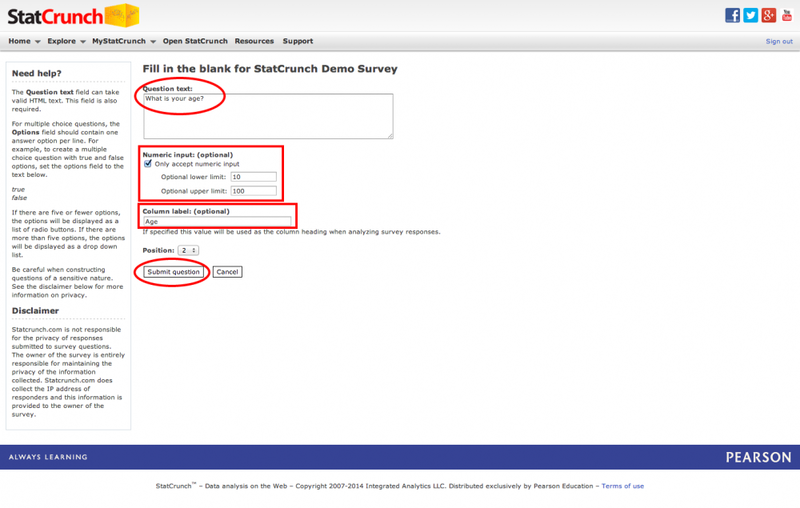 To view the steps for how to open a survey for responses and pull the results into StatCrunch, see Administering surveys and analyzing the data collected. 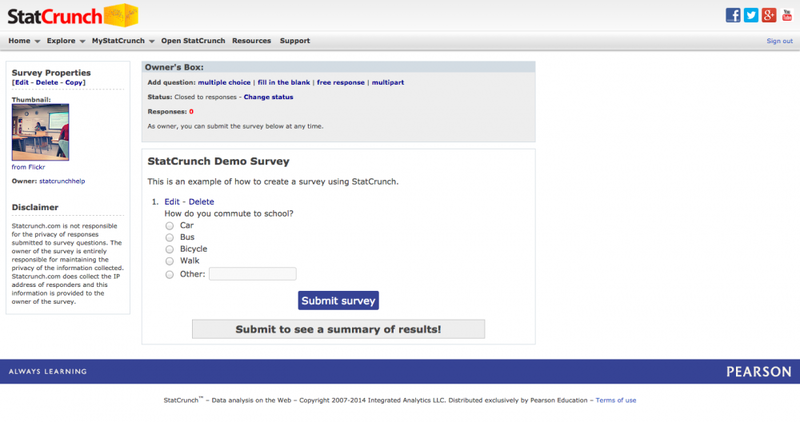 To create a survey, go to the statcrunch.com and sign in with your StatCrunch credentials. In the top menu, click MyStatCrunch > Surveys to open the My Surveys page shown below which lists all surveys created under your account. Click the Create a survey link on the far left of the page to start creating a survey. The resulting screen shot shown below shows the options available when creating a survey. Under Name, enter StatCrunch Demo Survey. Under Submissions, there are options for allowing multiple submissions and for displaying results. Leaving the Allow multiple submissions from the same respondent item unchecked will limit responses to one per device. Check the Display summary results after submissions box to allow each respondent to view a summary of the current results after their submission. 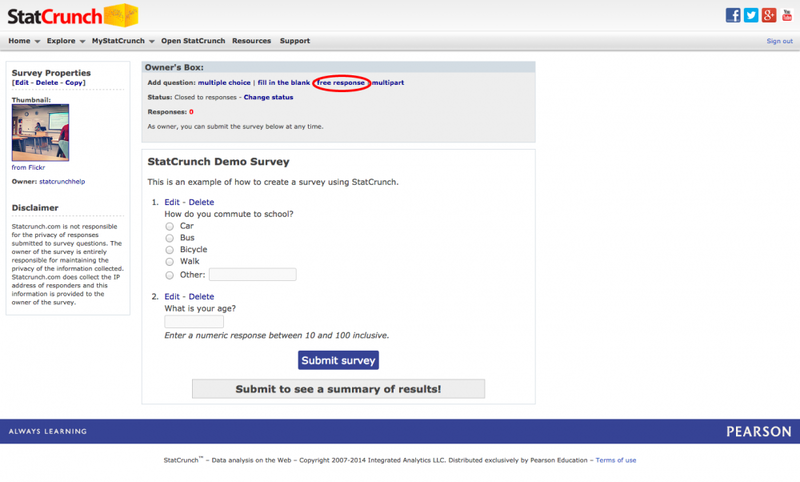 Enter "This is an example of how to create a survey using StatCrunch." under Description to provide additional information about the purpose of the survey. It is also possible to associate a thumbnail with a survey. Under Thumbnail, either select a file from your computer or search for an image using Flickr. 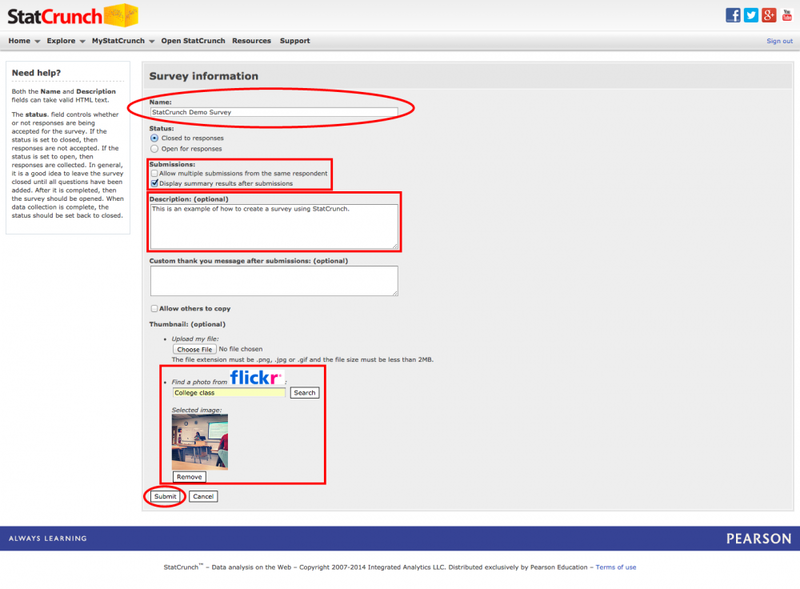 In this example, a search of Flickr for College student found the image displayed below. Click Submit to create the survey with a blank slate for survey questions. The newly created survey shown below has options for adding questions within the Owner's Box shown at the top of the survey page. Click the multiple choice link to open the page for editing multiple choice questions. For this demonstration survey, the objective is to collect information from a class of students. Under Question text, enter "How do you commute to school?". Enter Car, Bus, Bicycle, and Walk on separate lines under Options. Each of these items will appear as a answer choice for this question. The choose from common options link under Options can also be used to add options to the question. A number of possibilities are available including a range of integers (e.g., 1, 2, 3, 4, 5), the 50 U.S. states and a listing of all countries. Check the Add Other category with input field to have the last answer option be an Other category that accepts a fill-in-the-blank responses. Enter a Column label of Commute to have the responses appear with this column name when pulled into a StatCrunch for analysis. Click Submit question to add this multiple choice question as the first question in the survey as shown below. Note the Edit and Delete links next to the question number can be used to change the content of this question and remove it from the survey, respectively. 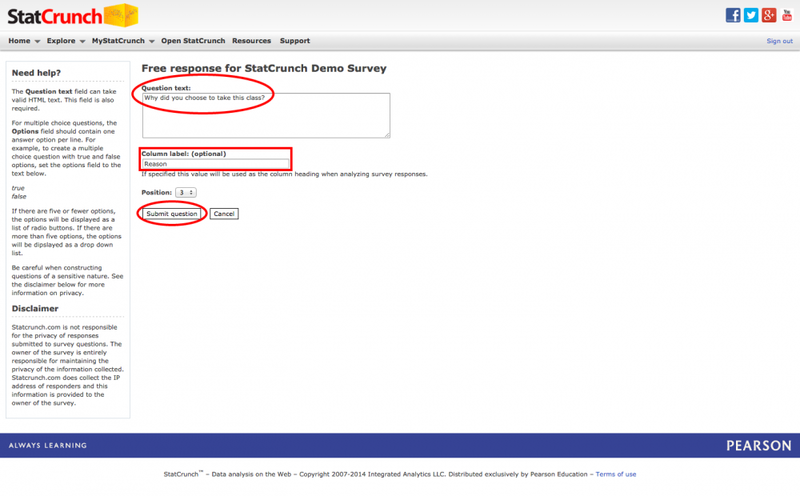 StatCrunch surveys can also contain questions that allow for simple numerical or text responses. On the page showing the current survey, click the fill in the blank link to open up the page displayed below for editing fill-in-the-blank questions. Under Question text, enter "What is your age?". To restrict responses to be only numbers, check the Only accept numeric input box. Numerical responses can be further restricted by setting the optional lower and upper limits controlling the range of acceptable values. Enter 10 for the Optional lower limit and enter 100 for the Optional upper limit to only allow ages above 10 and below 100, inclusive. Enter a Column label of Age to have the responses appear with this column name when pulled into a StatCrunch for analysis. Click Submit question to add this fill-in-the-blank question as the second question in the survey as shown below. Once again, note the Edit and Delete links next to the question number can be used to change the content of this question and remove it from the survey, respectively. Also, note the display of the acceptable range of values below the input box. 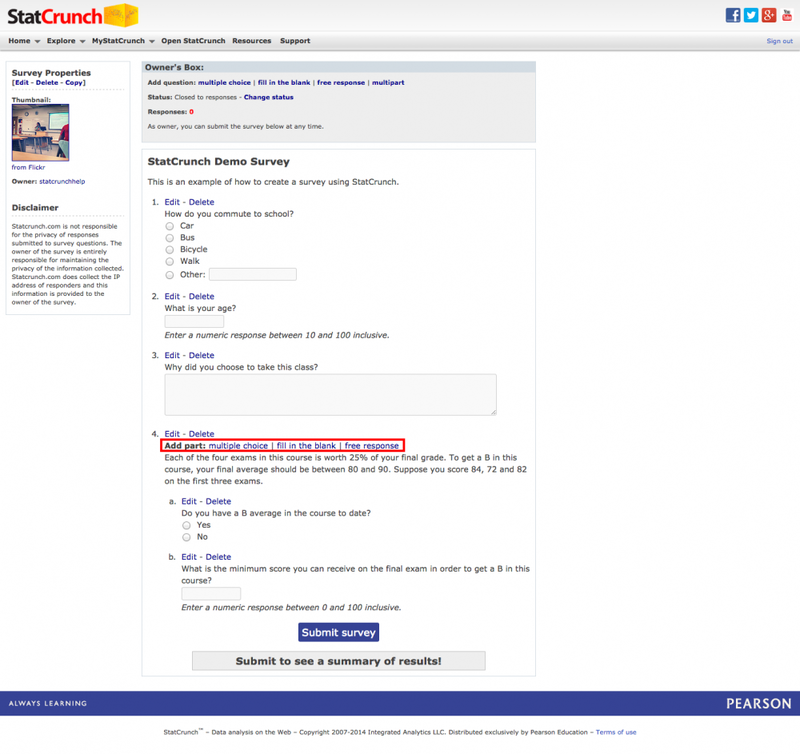 Questions that require longer responses can also be added to a StatCrunch survey. On the page showing the current survey, click the free response link to open up the page displayed below for editing free response questions. Under Question text, enter "Why did you choose to take this class?". This will give the respondent a text field with a larger response area where a response can be entered that is not limited in length. Enter a Column label of Reason to have the responses appear with this column name when pulled into StatCrunch for analysis. Click Submit question to add this free response question as the the question in the survey as shown below. Note the Edit and Delete links next to the question number can be used to change the content of this question and remove it from the survey, respectively. Also, note the larger response area for user input. In certain cases, several questions need to be linked together in a common framework. This can be accomplished by using the multipart question type. On the page showing the current survey, click the multipart link to open the page displayed below for editing the background information for a multipart question. The multipart question created here will test students abilities to understand the grading scheme used in the class. Enter "Each of the four exams in this course is worth 25% of your final grade. To get a B in this course, your final average should be between 80 and 90. Suppose you score 84, 72 and 82 on the first three exams." under Question text. This information acts as the common background that will be shared for the parts to be added below. Questions can be added to the multipart using the links next to Add part. Below shows a multiple choice and fill in the blank question added to the multipart.